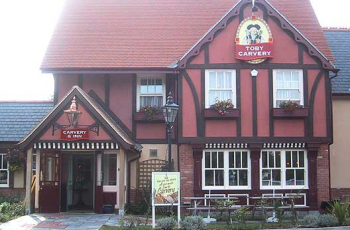 Sitting at the heart of the menu is Toby's famous carvery- Every day the chefs lay on a feast of tender, hand-carved meats with all the trimmings – including towering Yorkshire puds, golden roasties with all those lovely little crunchy bits, and plenty of freshly prepared veg, all crowned with proper gravy. They serve four types of meat; gammon, succulent roast beef, soft turkey and juicy pork all cut and served from our carvery bar straight onto your plate. There is also a great selection of pub food available and the drinks menu has everything you could want to wash it all down.